Which Smartphones Stuffed Stockings this Holiday Season? According to app analysis by Flurry, devices that run iOS (aka Apple iPhones) constituted just over half the mobile devices activated in the week leading up to Christmas. Their analysis is based on the assumption that the first thing someone does when they receive a smartphone is download apps. Here at Argus Insights, we track engagement through consumer reviews, to discover how consumers use and enjoy their devices. 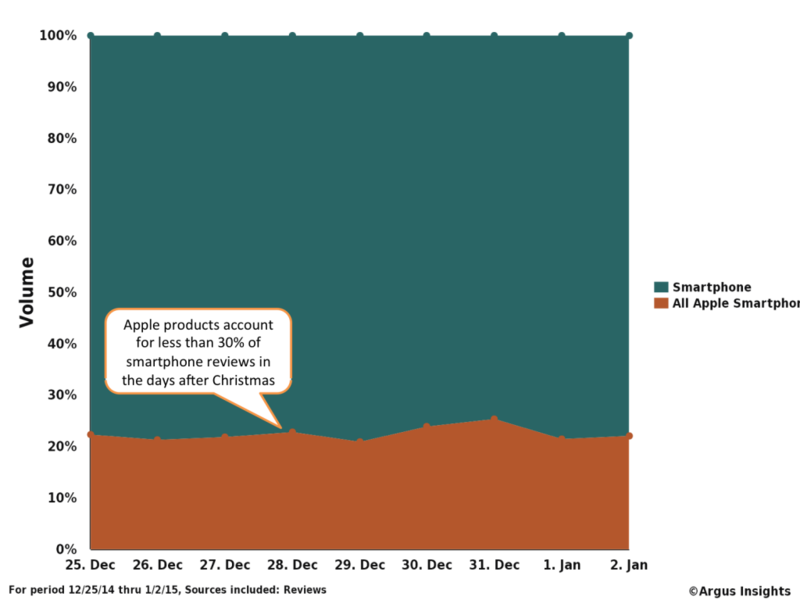 Our analysis shows that Apple reviews constituted less than 30% of all smartphone reviews in the days after Christmas. Since we constantly collect reviews across brands, we can compare the volume of consumer interaction and delight levels derived over time. 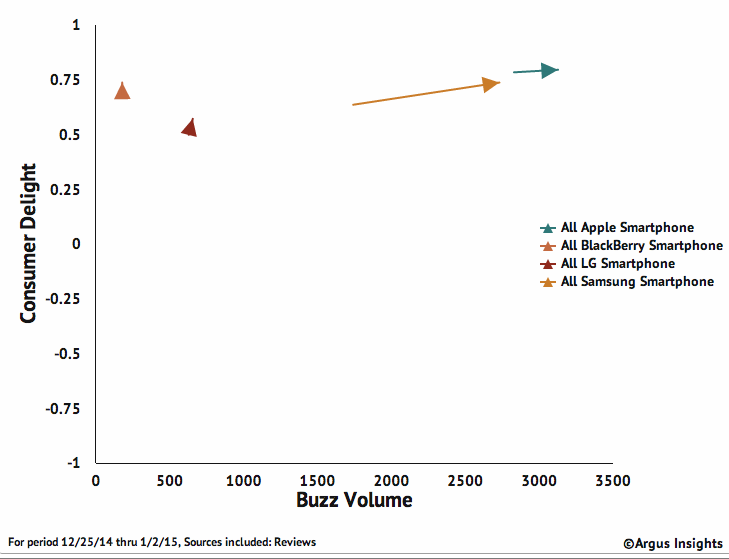 Doing this shows that while Apple received more attention overall, Samsung saw a larger post holiday boost in reviews. As for delight, people who found iPhones in their stockings were happier with their phone than those who received Samsung devices. Argus Insights tracks and analyzes consumer feedback in several markets. Check out our monthly Consumer Demand Reports for Smartphones, Home Automation, and Wearables, or contact us for custom analysis or access to our data and tools. Can Sprint Cut Out the Competition by Cutting Bills in Half? Sprint is Gaining Customers, But Can They Keep Them?